An extra five Class 345s have been ordered by Transport for London, in a £73 million deal. TfL already had 65 on order for Crossrail, with deliveries having reached 345030. Thirteen have been accepted for passenger traffic. The trains will be built by Bombardier at Derby Litchurch Lane, and will enable the Elizabeth Line (Crossrail) to serve Heathrow Terminal 5. They will be delivered by the end of next year. The contract also includes an expansion of the existing maintenance deal. “The additional trains will allow us to serve all the terminals at Heathrow and provide an increased frequency when the line is fully open in December 2019,” said Mark Wild, TfL’s Managing Director for London Underground and the Elizabeth Line. The full story will appear in RAIL 850, published on April 11, and available on Android/iPad from April 7. That’s good. 5 more additional Class 345’s to be added making the total of 70. 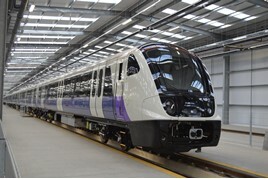 With parts of the Elizabeth Line to open in May and December this year and the central section to open in December next year. Plus Bombardier will also manufacture 9 more additional Class 710’s for London Overground as some of the Class 710’s will be formed as 5-Car units and the rest as 4-Car units. As 45 Class 710’s are to be manufactured and are due to enter service in May/June this year. And to transfer the Class 378’s on the Euston-Watford line to operate on the North London Line and East London Line services to add more capacity. And to replace the Class 172 DMU used on the GOBLIN line to WM Trains in December and replacing the Class 315’s and Class 317’s EMU’s on the Lea Valley “West Anglia” metro and Romford-Upminster shuttle services.